Millions of people in low-income households in England and Wales are facing hikes in their council tax as a result of government legislation currently going through Parliament, Labour has said. 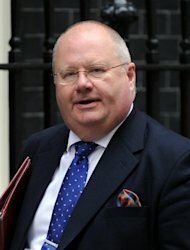 Under the Local Government Finance Bill, Communities Secretary Eric Pickles aims to save £450 million by cutting funding for council tax rebates by 10% from April 2013, leaving it up to individual local authorities to decide how they make up the shortfall. The first councils are now setting out how they plan to deal with the change, with Manchester launching a consultation last Friday on proposals to require all households except pensioners to pay at least 15% of the council tax bill, while Barnet is proposing a minimum 25% charge for all working-age residents. Since the introduction of council tax in 1992, rebates of up to 100% have been available to the unemployed, disabled people, full-time carers and households on low incomes, many of whom have not been required to pay the tax at all. Shadow local government secretary Hilary Benn said the planned change had left councils with a "terrible dilemma", forcing them to decide whether to impose council tax hikes on the working poor, the disabled or the unemployed. He warned of a repeat of the poll tax in the 1980s, when local authorities were forced to pursue poor people through the courts for payment of Margaret Thatcher's community charge. "Eric Pickles has lectured councillors that they have a moral duty not to increase council tax bills but in fact he has been planning a £450 million council tax bombshell of his own by increasing the bills paid by people on low incomes," said Mr Benn. "Local authorities face a terrible dilemma. Do they increase council taxes on the working poor - over 760,000 people nationally work but have lower council tax because their income is low - or the disabled or families with young children? "Just as happened with the poll tax, councils will be forced to chase people on low incomes for money they simply don't have. The Budget killed off David Cameron's claim that we are all in this together, but to see tax cuts for millionaires and tax increases for those on low incomes planned to come in on the very same day next April tells us everything we need to know about whose side the coalition is on." Local government minister Grant Shapps said: "Spending on council tax benefit more than doubled during Hilary Benn's time in power and welfare reform is vital to tackle Labour's budget deficit. Under Labour more taxpayers' money was being spent on benefits than on defence, education and health combined. "Our reforms will localise council tax support and give councils stronger incentives to support local firms, cut fraud, promote local enterprise and get people off the dole. We are ending Labour's something-for-nothing culture, which Hilary Benn is so keen to promote, and making work pay."